PanARMENIAN.Net - Foreign Minister Zohrab Mnatsakanyan and his delegation on Thursday, September 13 visited a newly-opened alley called Lanterns of Memory, a monument Geneva, Switzerland, dedicated to the memory of Armenian Genocide. In the photos published by the Foreign Ministry, Mnatsakanyan is seen taking a walk in the park in the Swiss city. Lanterns of Memory (Les Réverbères de la Mémoire), which is composed of nine tall bronze street light poles, was inaugurated in Switzerland in April, 10 years after the project was first approved. 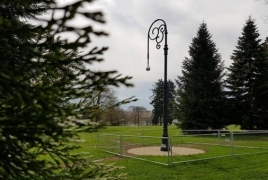 Authored by French contemporary artist of Armenian origin Melik Ohanian, the project in Geneva’s Trembley Park pays tribute to the links between Geneva and the Armenian community. Back in 2014, a letter from Swiss Foreign Minister and serving Swiss President, Didier Burkhalter, addressed to the canton of Geneva, recommended turning down the construction of a memorial, “Les Réverbères de la Mémoire”. The Geneva city authorities, however, remained determined to erect the eight-meter bronze memorial. The Swiss House of Representatives recognized the systemic massacre and exile of Armenians from their homeland by Ottoman Turks as Genocide in 2003.